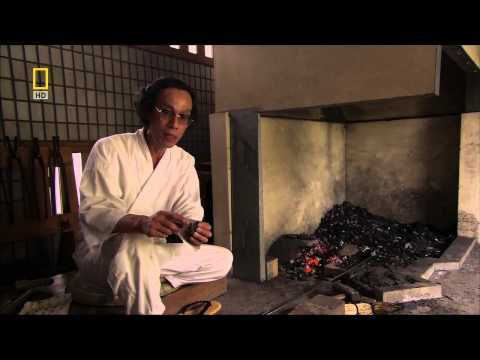 Students will learn the importance of the katana, its history, and how it is created. How long does the Furnace Master stay awake to watch over the furnace? How does the furnace master know the melted ingredients inside the furnace are ready? The raw steel that the katana sword will be made from. How do you think they get the lump of super hot steel out of the furnace? How much do you think this lump of steel is worth? On what Japanese island is Kyoto located? You only have to come to school 5 days a week for 6 hours. Imagine if you had to live here! Wait....that means I would have to live here too! Sounds crazy, but that is how dedicated the Japanese are to their art and their history. What two metals are combined to make the soft inner core and harder edge of the sword? How were the katana tested during times of peace? What happens to the shape of the sword when they put it in water? The rapid change from hot to cold makes the sword perfectly straight. The sword curves to become perfect for slicing. The metal of the sword cools slowly and becomes soft. Would you want the job of sharpening katana swords? Why or why not? What was the worst crime a Samurai could commit? Which sword do you think will win? The katana? Or European broadsword? Write your guess after Question 15. Check out the walls in the background and you can see racks of yari. They don't just teach sword fighting at this school. Stay focused. There will be an Exit Ticket question at the end. OMG. This dude is about to have an arrow fired right at him! Mr. Rowland still wants one. What can you learn about the culture and history of Japan from the katana?